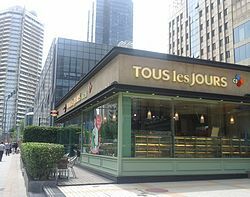 Tous Les Jours (Hangul: 뚜레쥬르) is a South Korean bakery franchise owned by CJ Foodville, a business group of CJ Group. Tous Les Jours means 'everyday' in French. Tous Les Jours is an "Asian-French" bakery serving a selection of bakery goods and beverages. It has more than 1300 locations in Asia and the United States. Tous Les Jours was established in 1996, with the first store opening in Guri, South Korea in September 1997. The company established a frozen dough facility in Um-Sung, South Korea in November 1997, starting mass production and distribution. In September 1998, the Tous Les Jours company began franchise licensing to the public. Tous Les Jours opened its 100th store in April 1999, and its 300th store in June 2001. In May 2002, the stores began offering coffees, sandwiches, fruit juices, and other beverages in addition to baked goods. The company switched to a "café-style bakery business model" in January 2003. In April 2004, Tous Les Jours opened its first store in the United States. In August 2005, it opened its first store in China. In June 2007, it opened its first store in Ho Chi Minh City in Vietnam. Tous Les Jours opened its 1000th store in July 2008. On November 11, 2011, Tous Les Jours opened its first store in the Philippines and on December 16, 2011, it opened its first store in Indonesia in Jakarta. On November 3, 2012, Tous Les Jours opened its first store in Cambodia. On June 23, 2013, Tous Les Jours opened its first store in Malaysia in Kuala Lumpur. By December 2013, Tous Les Jours has over 124 stores outside of Korea in 7 countries. China, United States, Vietnam, Indonesia, Philippines, Cambodia, Malaysia and Mongolia. On May 25th, 2017, Tous Les Jours announced closure of all 4 stores in Malaysia. ^ Lee, Hyo-sik (7 December 2012). "Retailers leave China for Southeast Asia". Korea Times. Retrieved 21 March 2013. ^ "CJ". Retrieved 23 October 2014. ^ "TOUS les JOURS USA - AUTHENTIC BAKERY". Archived from the original on 18 October 2012. Retrieved 23 October 2014. ^ "TOUS les JOURS USA - AUTHENTIC BAKERY". Archived from the original on 10 December 2012. Retrieved 23 October 2014. ^ "Tous Les Jours finally opens their flagship store in the Philippines". alexbamin3d. Retrieved 2013-11-04. ^ "Tous Les Jours is coming to Cambodia". cbm.com.kh. Archived from the original on 2013-08-09. Retrieved 2013-11-04. ^ "TOUS les JOURS opened up its first bakery in Malaysia". english.cj.net. 2013-07-26. Retrieved 2014-03-02. ^ "Famous bakery TOUS les JOURS will close four outlets in Malaysia". worldofbuzz.com. 2018-05-25. Retrieved 2019-02-23.